Local BirdLife groups including Coffs Coast Bird Observers, Bellingen Birders and BirdLife Northern NSW are all enthusiastically on board, as are National Parks and Wildlife Service. The project will involve the two high schools, local artists Sara Bowen, JP Willis, Jo Elliott and poet John Bennett; the members of two local birding groups, Coffs Coast Bird Observers and Bellingen Birders; National Parks and Wildlife Service (NP&WS) staff, including local Gumbaynggirr Elder Uncle Mark Flanders and staff of the gallery. As well as entire the Overwintering Project Print Portfolio, the Coffs Harbour exhibition will include works by local artists and the students from the local high schools. The Gallery recently got a grant to bring together high school students, Elders, scientists, birders, poets and artists to learn about shorebirds and make art, culminating in a 'steamroller print' project to be exhibited alongside other works inspired by local migratory shorebirds and their habitat! Many thanks to the gallery curator, Jo Besley, for her amazing support of and vision for the project. Some beautiful shorebird linocuts by Penelope Lawry. Penelope is one of the central organisers of the Coffs Harbour exhibition, and will be helping to co-ordinate the creation of a group work for local artists called Wall of Wings that will be a feature of the Coffs Harbour Overwintering exhibition. Opening Friday 28 June, 2019. This exhibition is timed to coincide with the 2019 Australasian Ornithological Conference (3 – 5 July 2019), to be hosted by Charles Darwin University. Due to the limiting size of the gallery, the exhibition will only feature a selection of prints from the current Overwintering Project Print Portfolio alongside works by CDU students and local artists. During the exhibition, Overwintering site visits may be organised for artists wanting to contribute to the Overwintering Project Print Portfolio. People interested in registering from the conference can do so here: https://www.aocdarwin.com/. Registrations close 14 June 2019. When Burnie Regional Art Gallery Director Dawn Oelrich attended the opening of The Overwintering Project: Mapping Sanctuary at Moonah Arts Centre on October 26 2018, she was very pleased to confirm that Burnie Regional Art Gallery will host an Overwintering Project exhibition over the summer of 2020-2021! This is an exciting development for the Project as BRAG of course has such a wonderful history of supporting and promoting Australian printmaking through the prestigious Burnie Print Prize. We look forward to future developments! Ruddy Turnstones, 2018. Hand-coloured linocut and Overwintering Project Print Portfolio contribution by renowned Tasmanian artist Kit Hiller. An Overwintering Project exhibition featuring works by members of Mount Gambier's Thumbprint Workshop Inc. and friends. Left: Rockpool. 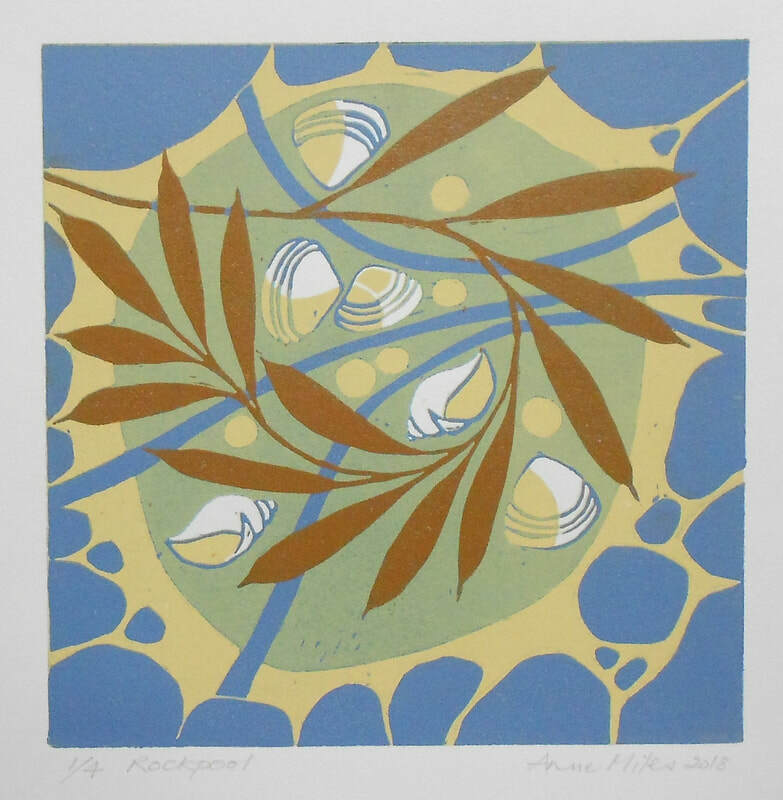 Reduction linocut by Thumbprint Workshop member Anne Miles. A local Overwintering Project exhibition by members of Migaloo Press and friends. It will be exhibited at the Gladstone Regional Gallery along with Jill Sampson's Bimblebox 153 Birds. Migaloo Member Jenny Sanzaro-Nishimura, 2017, Red Knot to be Forgot? Screen Print, mokulito, watercolour, colour pencil. The project will examine and showcase the local migratory shorebirds, in particular those sighted at the Western Treatment Plant. 20+ printmakers will participate in the project culminating in an exhibition of one framed print each as well as 3D/sculpture installation at Artspace. Hobson's Bay City Council is working with The Overwintering Project and its partners including Bird Life Australia to highlight the unique birdlife and habitats that we have within our local area. The exhibition will result from a series of free workshops run monthly between September 2018 and April 2019. 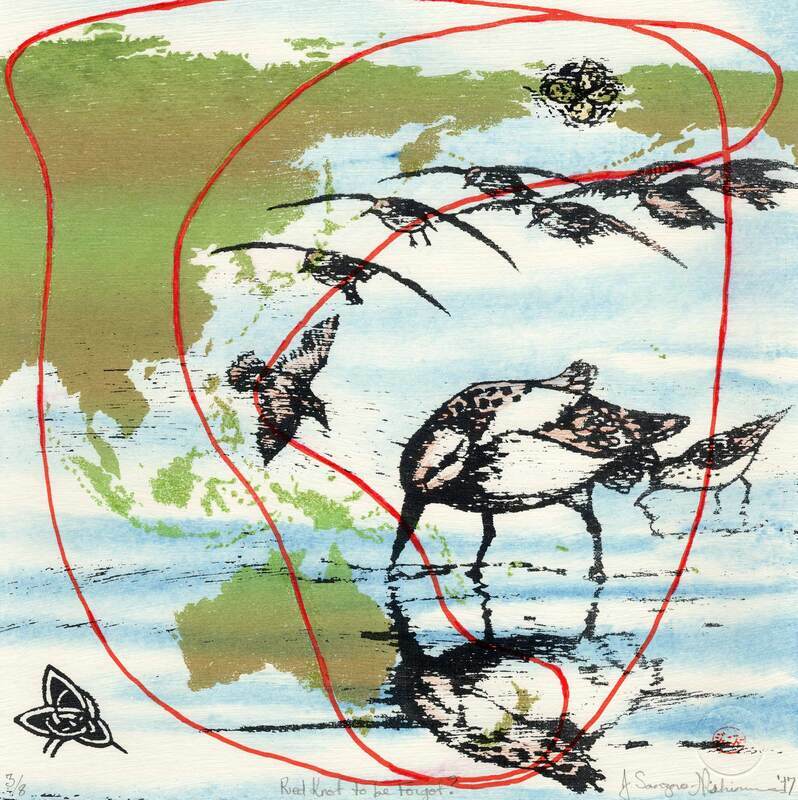 ​Through a series of artist-led workshops, the project will focus on migratory shorebirds and their current vulnerability. Artists attending the workshops, to be held at various local habitat sites and the Woods Street Art Space in Laverton, are invited to contribute original prints created in response to the unique nature of local Hobsons Bay bird habitats. Following the workshop program a selection of prints produced from The Overwintering Project workshops will be displayed in May 2019 at the Louis Joel Gallery in Altona. This exhibition will be part of the 2019 Hobson's Bay World Migratory Bird Day Festival. Image by workshop facilitator Geoffrey Ricardo. 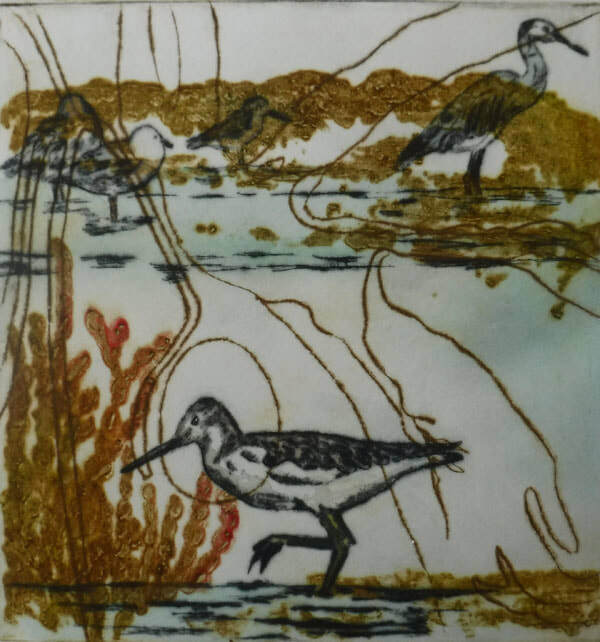 Mary Pulford, 2018, I think it’s a Greenshank, drypoint, carborundum, a la poupée with hand colouring, 3 plates. If you are a local artist who would like to be involved, please email: overwinteringproject@gmail.com. ** Local Exhibitions are organised by artists, workshops, institutions or organisations to engage local communities with the Overwintering Project, their local shorebirds and their local shorebird habitat.